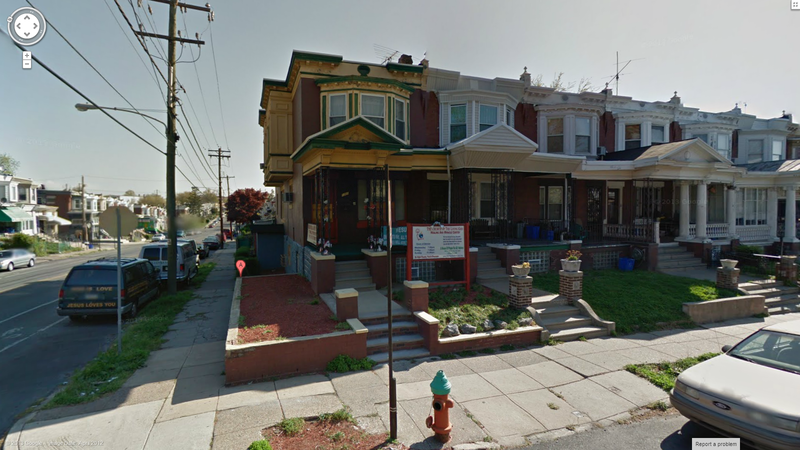 The picture below is where I grew up in West Philadelphia. My house is the one on the corner with the yellow paint. The bedroom my sister Miriam and I shared is behind the front bay windows on the second floor. The sign in front of the house proclaims it “The Church of the Living God Healing and Miracle Center.” I assume they are using my father’s office and waiting room from his GP days as their healing center. Their website, http://www.thechurchofthelivinggod.org/ , doesn’t seem to have been updated in years, but Rich and I drove past it one Sunday and did indeed see services letting out, so the church is functioning, which I found oddly comforting. I might drop by someday to look inside, but I know I wouldn’t be home. The meeting with Esau seems elaborately formulaic, like Abraham’s bargaining to obtain a gravesite for his Sarah (Gen. 23:10-16). The Hebrew word for “he (Esau) kissed him (Jacob)” has little dots on top of the letters in the text, as if the compilers couldn’t believe what he (Esau) was doing. The reunion seems to go well, with each catching the other up on how well they’re doing. Jacob is obsequious enough to placate Esau, referring to himself as “your servant” and to Esau as “my lord” and even saying “ to see your face is like seeing the face of God, and you have received me favorably. “ which I think is laying it on a bit thick. Although Esau offers to accompany Jacob’s family on their way, or at least lend him some of his men, Jacob begs off, a wise precaution in light of Esau’s volatility. Jacob does not go straight home, but settles for a time in Shechem. Then the prince, Shechem son of Hamor, rapes daughter Dinah and afterwards wants to marry her. Dinah’s brothers Levi and Simeon OK this but insist that all the males of Shechem be circumcised. While they are recuperating, Levi and Simeon massacre them all. Astonishingly, Jacob’s admonishment concerns only his own reputation. The family moves on, to Beth El, where Jacob had seen that ladder so many years earlier. There, after a household purification that includes getting rid of all their little household gods, Jacob is formally re-named Israel, though he’s still often called “Jacob” in the text. But the rest of the trip home is not trouble free. Rebecca’s nurse Deborah dies and is buried at Beth El (no, I don’t know why she was with them). Sadly, Rachel dies giving birth to a last son, Benjamin, and is buried on the road to Ephrath, now Bethlehem. Reuben asserts his status as eldest son by sleeping with his father’s concubine Bilhah, which totally disgusts Israel. Finally, they arrive at Mamre and find Isaac still alive, still living where Abraham had lived. We are not told anything about the reunion of Isaac and Jacob. We assume Rebecca has died, though this is not in the text, unlike Sarah’s death. Isaac dies at 180, and, together, his two sons, Jacob and Esau, bury him. A list of Esau’s descendants closes out his story at the end of the portion. Next week, Jacob’s sons take center stage. 13 Driving your fellow Congressman into the turnbuckle now considered acceptable method of ending a filibuster. 12 President now shouts entire State of the Union address with his face 18 inches from TV camera. 7 January 20: Inauguration ceremonies January 21: FDA approves over-the-counter sale of steroids. 5 During House debate, it is acceptable to yield to the gentleman wielding a folding chair. This entry was posted in Uncategorized and tagged Benjamin, Beth El, Esau, Isaac, Israel, Jacob, name change, Rachel, reunion, wrestling. Bookmark the permalink. I can never get over how different it looks today.